I've been down with an 'orrible cough for the past month (so unfair in summer!) and once again the blog has been neglected. Now I'm back, I realise I forgot to repost my essay on 'The Horse and His Boy' - and as I haven't yet got around to finishing the one about 'The Last Battle' - I'll get there, I promise - here's this to be going on with. This, the fifth Narnia book in order of publication, is the one I’ve thought about least since childhood. And it was never one of my particular favourites, which seems odd considering that next to Narnia, ponies were my passion. 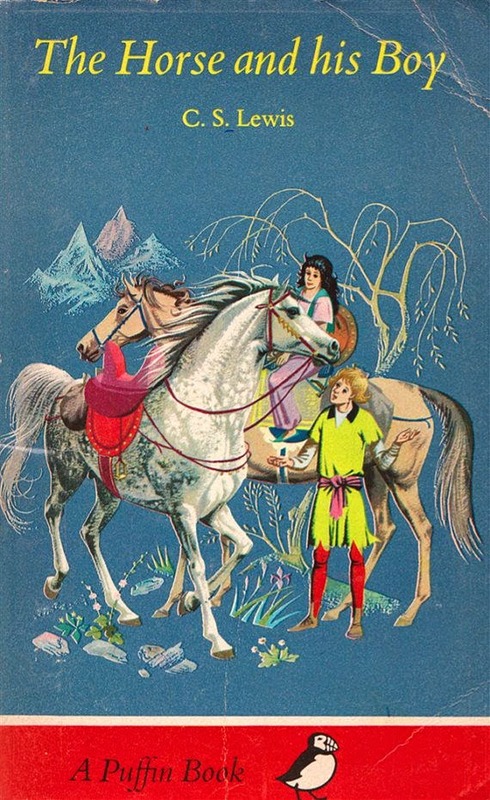 A book which combined Narnia and horses ought to have been a big hit. I enjoyed the book, but I didn’t love it the way I loved The Voyage of the Dawn Treader and The Silver Chair. This may be because it’s the least complex, least layered of the Seven Chronicles. It’s a simple adventure story offering straightforward pleasures: appealing characters, obnoxious villains, touches of humour, an arduous journey and a nick-of-time rescue. What it doesn't offer – alone among the Narnia books – is anything much in the way of strong emotion, wonder or awe. Certainly nothing to match the moment when the Stone Table cracks in two, or when Reepicheep’s coracle vanishes over the crest of the wave at the end of the world, or the brilliant birds fluttering in the trees at the top of Aslan’s holy mountain, or the poignant death of old King Caspian. To use Lewis’s own words, I can find no ‘stab of joy’ in The Horse and His Boy. On this re-reading I was entertained and amused by the book, but seldom moved. Told throughout from within – from the point of view of characters who were born in Narnia rather than in our world – The Horse and His Boy is set during the ‘golden age’ when the four thrones of Cair Paravel are filled by the four children of The Lion, The Witch and The Wardrobe. 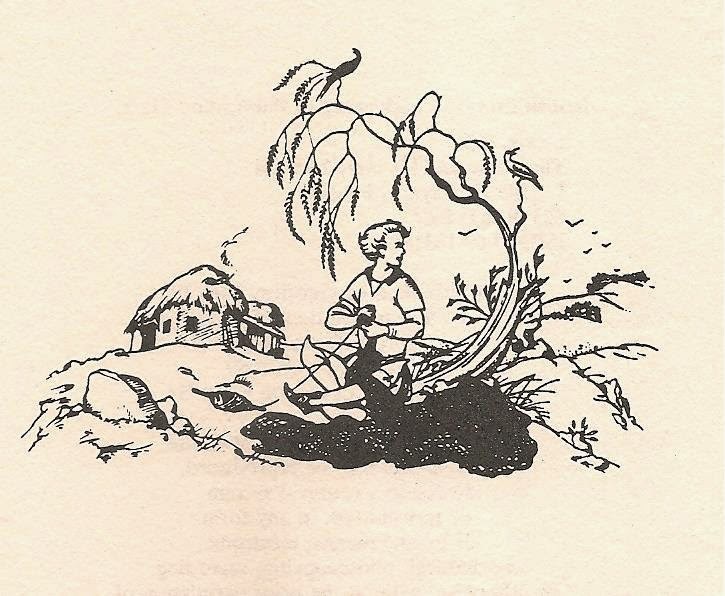 The hero of the book, the boy Shasta, has grown up to the age of perhaps twelve believing himself the son of Arsheesh, a poor fisherman in the southern land of Calormen, a country which will remind most readers of the Persia of the Arabian Nights. And we run into an immediate difficulty. The dark-skinned Calormens are depicted in a way that strikes me now as at best naively Orientalist, at worst upsettingly racist. ‘The white dog!’ hissed the Arab leader, and his scimitar grated against my cutlass… I saw the dark triumphant face of my antagonist, the curved beam of reflected light raised to strike, and like a flash I ducked, and striking upwards with my left hand, administered a thoroughly British uppercut. And, because an Oriental can never understand such a blow, he reeled back, a look of almost comical surprise on his face. Ere he could recover, I lunged out with my cutlass and stretched him dead upon the ground. While you’re recovering: I have a theory that classic children's books have a half-life of about fifty years of being read by actual children (after a century, most are relegated at best to academic study). They last this long mainly because adults give or read to children the books they themselves remember, and because books are durable physical objects that may sit for decades on dusty shelves to be pulled out by voracious young readers. This is how I gobbled down the jingoistic and now practically unreadable works of GA Henty, written in the last third of the nineteenth century. What modern ten year-old could tolerate ‘Under Drake's Flag, A Tale of the Spanish Main' (1883) or 'By Sheer Pluck: A Tale of the Ashanti War' (1884)? They were eighty years old by the time I was reading them in the 1960s and surely I must have been in the last generation of children who could possibly have enjoyed them. But the sixty year-old Narnia stories are very much with us, kept alive like the Velveteen Rabbit by the love of real children. Henty's prejudices may no longer matter, but those of CS Lewis are still of concern. And I can't help feeling he should have known better. As an adult, Geoffrey Trease set out to combat the prejudice he’d parroted as a boy. 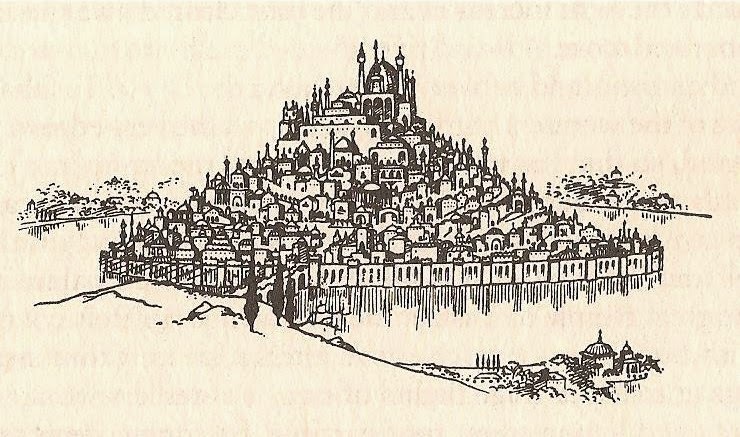 His historical novels for children, like ‘The Red Towers of Granada’ (1966), are deliberately respectful of ‘other’ cultures like those of Judaism or Islamic Spain. In spite of his efforts, the range of literature available to me growing up in the sixties was still crammed with dodgy foreigners, cunning, or comic, or cowardly, or cruel. I noticed, without realising it was unfair. So long as an author spins a good story, children are accepting readers. Two merchants of Calormen … approached. The Calormen have dark faces and long beards. They wear flowing robes and orange-coloured turbans, and they are a wise, wealthy, courteous, cruel and ancient people. They bowed most politely to Caspian and paid him long compliments, all about the fountains of prosperity irrigating the gardens of prudence and virtue – and things like that – but of course what they wanted was the money they had paid. There’s no love or tenderness between Arsheesh and Shasta: the latter is simply relieved to learn that he’s not the fisherman’s own flesh and blood. 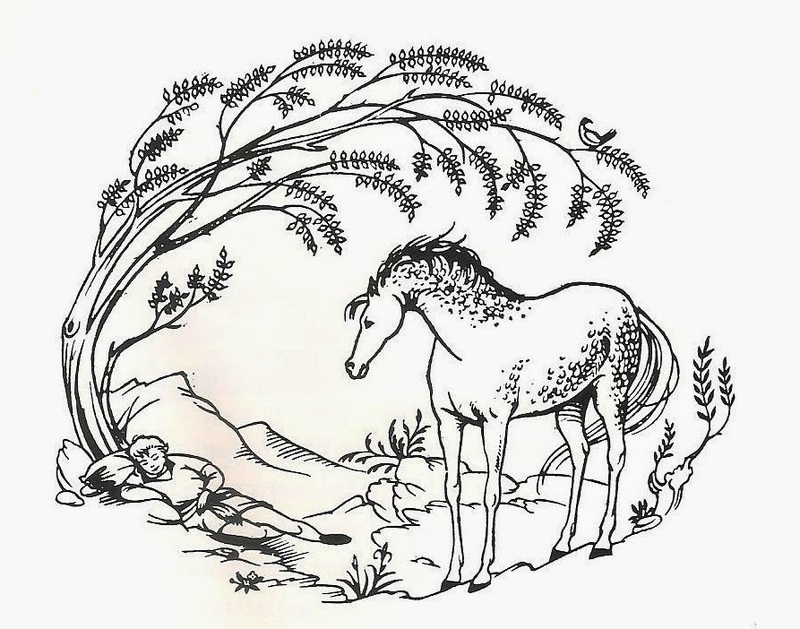 He even dreams of possible advancement (‘the lordly stranger on the great horse might be kinder to him than Arsheesh’). Lewis soon dispels this dream, and leaves an adult reader in some discomfort as to why this Tarkaan has suddenly taken a fancy to buy Shasta. Admiration for despised beauty is never a good sign. What is Bree the Talking Horse implying, when he warns Shasta in the strongest terms that the Tarkaan is bad – ‘Better be lying dead tonight than go to be a human slave in his house tomorrow’? Aged ten I simply assumed ‘hard work and beatings’. Now I wonder whether this might truly be a 'fate worse than death'. Orientalism is a term employed by Edward Said to critically examine patronising Western perceptions of the East: it marks a subset of racism which views Eastern cultures as despotic, fanatic, mysterious, 'inscrutable' and inferior. Lewis’s characterisation of the dark-skinned Calormen, quoted above, as ‘wise, wealthy, courteous, cruel and ancient’ could be a textbook example. If Trease overcame his early conditioning, why couldn’t Lewis? Yes, there is Aravis, yes there is the gentle and courteous knight Emeth in The Last Battle. They remain exceptions. But there is more going on. Narnia is a paradise of happy magical creatures and talking animals. By contrast, Calormen is a grown-up country of farms and roads, a religion and a class structure, a bureaucracy, a literature, slaves and soldiers and cities. Despite its supposed Arabian Nights exoticism, from a child’s perspective Calormen is a dull place. How come? Where are all those flying carpets*, magical rings, terrifying jinni, sorcerers and enchantresses with which Scheherezade filled the Thousand and One Nights? Lewis ditched them all. He borrowed the trappings of the Arabian Nights but left out all the magic. Shasta was not at all interested in anything that lay south of his home because he had once or twice been to the village with Arsheesh and he knew that there was nothing very interesting there. In the village he only met other men who were just like his father – men with long, dirty robes, and wooden shoes turned up at the toe, and turbans on their heads, and beards, talking to one another very slowly about things that sounded dull. It’s not as though the Narnia books haven’t already carried us to foreign lands. The wilds of Ettinsmoor, the depths of Bism, the numinous islands of the Eastern Sea – these belong, these fit within the Narnian fairy world. But Calormen isn’t a fairytale land. It exists to oppose Narnia’s every quality. If Lewis had wanted, he could have incorporated peris and griffins, flying carpets and sphinxes into his story, but he didn’t want. Not even the ghouls of the Tombs are ‘real’. In a fantasy series which happily blends classical and Norse mythologies, medieval legends and talking animals, why did Lewis instinctively (I doubt he thought about it) strip all the magic from the Arabian Nights? Where else in the Narnian world does this failure of enchantment occur? Answer: on the unmagical Lone Islands, in the least interesting episode of The Voyage of the Dawn Treader, where the Calormen trade for slaves – and in King Miraz’s Narnia, where the only town, Beruna, is demolished by Aslan and the personified powers of nature, a destruction significantly presented as a restoration. Narnia at its most Narnian is a place of joyful and magical disorder, a place in which there is no need for rules because no one wants to do anything bad. It owns no villages like Shasta’s, no cities, no roads. Cair Paravel is a stand-alone fairytale castle. King Lune’s castle of Anvard in Archenland is similarly isolated. Unlike the threat posed by the magical White Witch and Green Lady, the threat to Narnia from Calormen (and the Telmarine rule of Miraz) is a divorce from magic. The Calormen are enemies of the imagination, enemies of fairyland itself. Their rule would destroy Narnia's magic, substituting an order of economics, progress, trade, politics, scepticism: necessary but unromantic things which Lewis didn’t like and didn’t want in his fairy paradise. The be-turbaned, Arabian Nights-style Calormen represent these values however, only because Lewis chose they should. Historically it was the West which imposed its industrial and political values upon the rest of the world. In some conservative Christian circles CS Lewis is the logic-chopping wielder of the Sword of Truth. But he could and did allow prejudice to blind him. No doubt at the back of his mind was the medieval clash between Islam and Europe: the Matter of France, the Song of Roland, the Battle of Lepanto. Compared with the magic of the pagan Greek myths (so important a component in western education as, paradoxically, to have become a part of Christian European identity) I suspect Lewis felt deep in his bones that the magic of the Arabian Nights was foreign, inimical, incompatible with Aslan’s. So he left it out, but his depiction of the Calormen people creates all sorts of problems. They are undoubtedly human, so where have they come from? Are they, like Peter and Edmund, Susan and Lucy, ‘sons of Adam and daughters of Eve’ - originally from our world? When Aslan sang Narnia into existence in The Magician’s Nephew, did he create the Calormen too? He made their land: Polly and Digory glimpse the desert sands from Fledge's back. And what about their gods, Zardeenah, Azaroth and Tash? There'll be more to say about these questions when we come to The Last Battle. For now, though, on with the story! 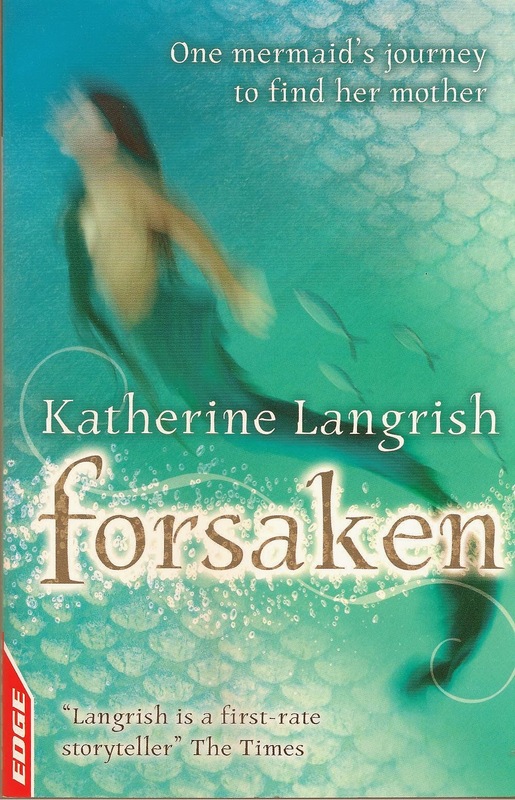 One of the things I truly loved about this book was the relationship between Shasta and Bree, the Narnian Talking Horse who, like Shasta, was kidnapped as a little foal. A pony-mad little girl, I found the story of Shasta being taught to ride by his horse enchanting (“No one can teach riding so well as a horse”). Bree, or to give him his full name, Breehy-hinny-brinny-hoohy-hah – is a superb character. I loved and still love his good-humoured disdain for Shasta and for humans in general (“What absurd legs humans have!”) and his bracing lack of sympathy for Shasta’s aches and pains (“It can’t be the falls. You didn’t have more than a dozen or so.”). 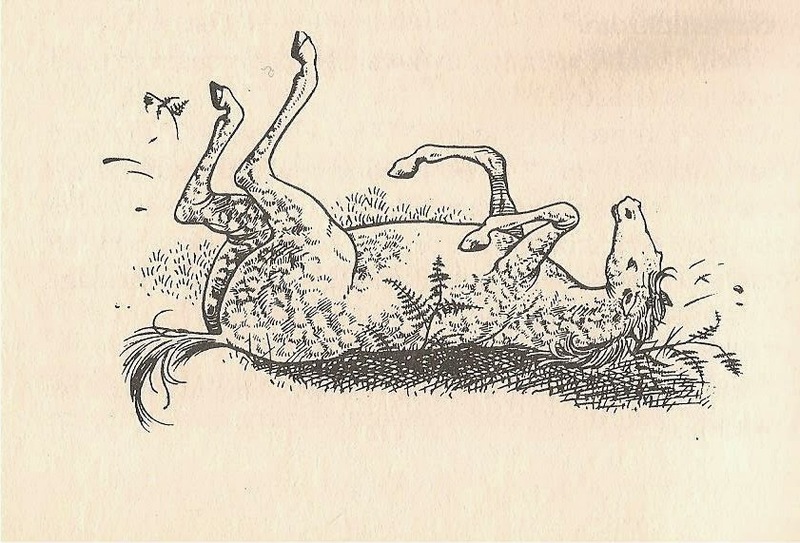 An experienced war-horse, Bree takes initial charge of the escape, but as the adventure continues it is the inexperienced Shasta who begins to make the difference, while Bree allows vanity and insecurity (would a true Narnian Talking Horse enjoy a good roll?) to undermine him. One night after ‘weeks and weeks’ of journeying, Bree and Shasta hear another horse and rider accompanying them northwards between the forest and the sea. 'Craning his neck around and twitching his ears': Lewis never forgets that Bree is a horse. The strange ‘horseman’ seems as eager to avoid them as they are to avoid him, but lions attack. 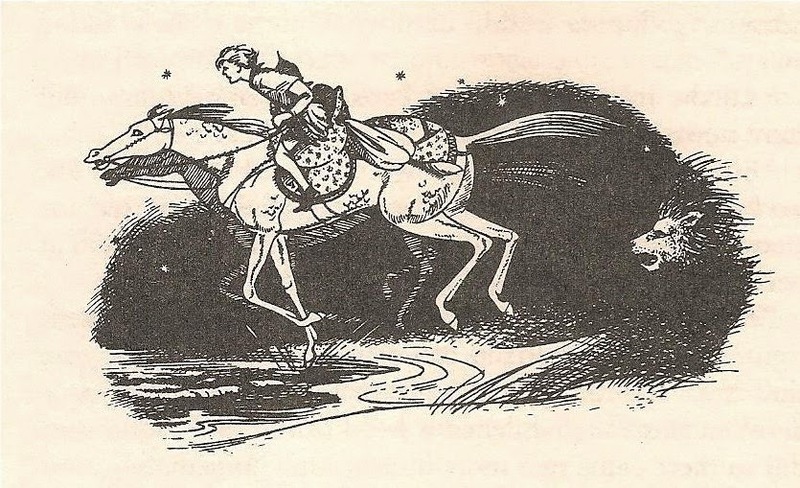 The two horses are driven together in a mad gallop across the sands, and the young rider – described as a ‘small, slender person, mail-clad … and riding magnificently’ is revealed as a girl, Aravis, with ‘her’ Talking Horse, Hwin. It’s a dramatic entrance, and Aravis takes no prisoners from the start. When the book was written fifty years ago, this ‘only a girl’ thing was everywhere, a universal pollutant we all breathed. In Little Women, in What Katy Did – in Enid Blyton’s books about the Famous Five, even in Geoffrey Trease – my friends and I encountered heroines who wished they were boys, and we didn’t always understand that this wasn’t because boys were naturally superior, but because society privileged them with better choices and opportunities. So it was great to meet competent, confident Aravis who rode a horse the way I wished I could, and wore a sword too. And when Shasta comes out with this classic put-down, ‘only a girl’, Aravis annihilates him. Later in the book, when Hwin quietly suggests it would be wise for them to keep going, Bree retorts crushingly: 'I think, Ma'am... that I know a little more about campaigns and forced marches and what a horse can stand than you do'. (Stallionsplaining!) And Hwin shuts up because she is 'a very nervous and gentle person who was easily put down.' But Hwin is right and Bree is wrong, and his decision is a bad one. In my mind, Lewis is certainly an equal-opportunities author. And Jephthah came to Mizpah unto his house, and, behold, his daughter came out to meet him with timbrels and with dances; and she was his only child… And he rent his clothes, and said, Alas, my daughter! thou hast brought me very low… for I have opened my mouth unto the Lord and I cannot go back. And she said unto him, My father, if thou hast opened thy mouth unto the Lord, do to me according to that which hath proceeded out of thy mouth. … And she said unto her father, Let this thing be done for me: let me go alone two months that I may up and down upon the mountain and bewail my virginity, I and my fellows. And he said, Go. And he sent her away for two months: and she went with her companions and bewailed her virginity upon the mountains. And it came to pass at the end of two months that she returned unto her father, who did with her according to his vow which he had vowed. In this case Lewis redeems the story. Aravis does what we might all wish Jephthah’s unnamed daughter could have done. 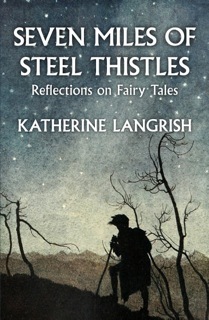 She tricks her father, obtains three days grace, drugs her maid, dresses in her brother’s armour and races for Narnia on Hwin – covering her tracks further by sending her father a letter as if from her betrothed husband claiming to have married already after a chance meeting in the woods. Aravis displays from the beginning great competence, cool-headedness and fortitude: she is, as Lewis later comments, ‘proud and could be hard enough but… as true as steel’. What she doesn’t have is empathy: it is left to Shasta the underdog to wonder what might have happened to the maid Aravis drugged and left behind. “Tear for tear, throb for throb, blood for blood.” Does Aslan punish Aravis because her action got the slave-girl into trouble? No, it's because she wasn’t sorry about it and didn’t care. Aravis’ punishment cannot help the slave-girl, who will never even hear of it. “You needed to know what it felt like”: this is about Aravis herself, to correct a flaw in her character and teach her to empathise. It seemed fair to me as a child. (“Children, who are innocent, love justice, while most of us are wicked and naturally prefer mercy,” GK Chesterton said.) But now? Now I think this is penny-in-the-slot justice. You do something bad: something bad happens to you: end. How neat it would be if, as Jesus said, ‘With what measure ye mete it shall be measured to you again’, but it doesn’t work that way in life and even if it did, where is the victim in this? Aslan lays no responsibility on Aravis to consider that slave-girl again, or to try and help her. In fact he discourages her from doing so, saying as he often does that it is ‘not your story’. Again: this is an adventure story and most adventure stories would never raise the issue of ‘what happened to the slave girl?’ in the first place – but having raised it, Lewis doesn’t seem to me to deal with it well. Aravis doesn't have to do anything but accept her lesson and grow in compassion and understanding. Oh, and trust in Aslan to see the slave-girl right... Isn't that just as self-centred? It’s easy but dangerous to relinquish earthly justice to one’s notion of the divine. Where was justice for Jephthah’s daughter? I don’t like Aslan very much, in this book. Their tunics were of fine, bright, hardy colours – woodland green, or gay yellow, or fresh blue. Instead of turbans they wore steel or silver caps… The swords at their sides were long and straight, not curved like the Calormen scimitars. And instead of being grave and mysterious like most Calormenes, they walked with a swing and … chatted and laughed. One was whistling. You could see they were ready to be friends with anyone who was friendly and didn’t give a fig for anyone who wasn’t. Shasta thought he had never seen anything so lovely in his life. Reading this for the first time I was of course thrilled to back in the company of real Narnians at last, and Lewis makes them sound attractive indeed – a breath of fresh air. Now I can’t help noticing how every word is loaded so that even the Narnians’ dress choices appear ‘better’ than those of the Calormen. Do Calormen people never dress in blue, yellow or green? And why in any case should those colours be preferred to red, purple or gold? Because those are colours associated with luxury, and by further implication with moral degeneracy? It would be even sillier to say out loud that the ‘straight’ Narnian swords suggest directness and honesty while the ‘curved’ Calormen scimitars denote indirectness and treachery – but that’s what this passage manages, on a subconscious level, to imply. 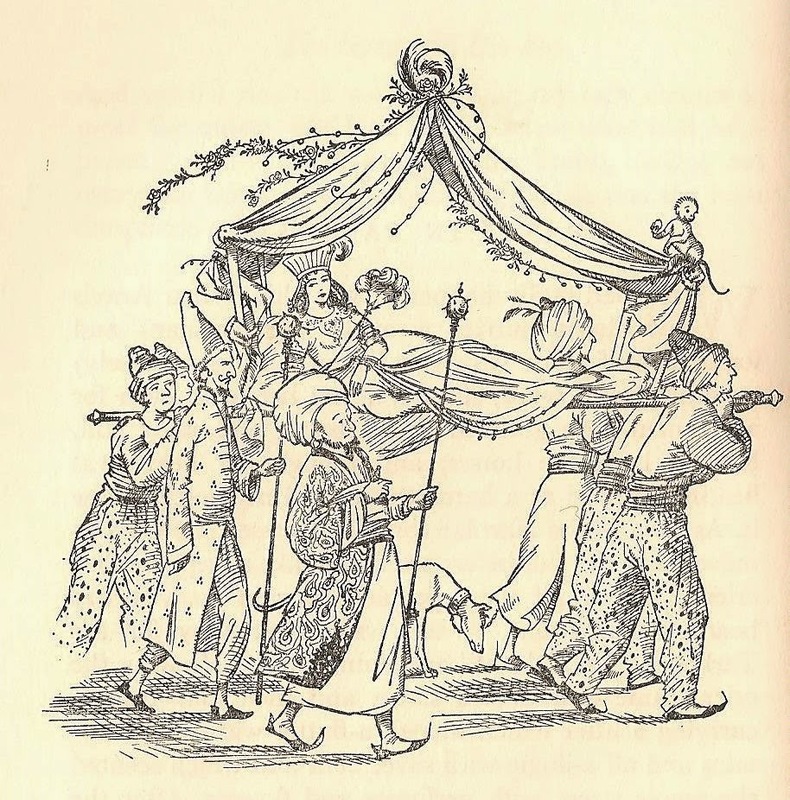 Snatched from his friends, Shasta is taken away to the Narnians’ guest suite in a great palace, where he is scolded as a truant. In the same way that young Tom Canty in The Prince and the Pauper is mistaken for King Henry VIII’s son Prince Edward and assumed to have lost his memory from ‘too much study’, Mr Tumnus (hooray!) suggests to Edmund and Susan that the ‘little prince’ must have a touch of sunstroke. ‘Look at him! He is dazed. He does not know where he is.’ Told to rest on a sofa and given iced sherbert to drink, Shasta overhears all the Narnians’ discussions. Queen Susan no longer wishes to marry Prince Rabadash who is turning out – in Edmund’s words - ‘a most proud, bloody, luxurious, cruel and self-pleasing tyrant’. In the course of their discussions Shasta learns of a secret desert route which he and his friends will take once reunited. But the Narnians intend to escape by sea, and now Shasta hopes to go with them. This is disconcerting selfishness. If it weren’t for Corin’s sudden return (having got into a fight and been arrested by the Watch) Shasta would abandon his friends. His readiness to make excuses for himself and to think badly of Aravis may be realistic but it's not endearing. Lewis dedicated THHB to David and Douglas Gresham, the young sons of the American writer Joy Davidman whom he was to marry in 1956, two years after the book was published, and I wonder if he chose a boy protagonist for their sake? Shasta is the first main male protagonist in the Narnia books (in order of publication), but Lewis doesn’t really love him. Aravis has more flair, Bree more personality, Hwin more compassion... From the beginning Shasta is starved of depth. In his memoir Surprised By Joy Lewis recalls how uncomfortable he and his brother were when their father engaged them in emotional conversations after their mother's death. Did he think the Gresham boys would find emotion - other than fear - soppy? You must not imagine that Shasta felt at all as you or I would feel if we had just overheard our parents talking about selling us for slaves. For one thing, his life was already little better than slavery… For another, the story about his own discover in the boat had filled him with excitement and with a sense of relief. He had often been uneasy because, try as he might, he had never been able to love the fisherman. Aravis produced rather nice things to eat from her saddlebag. But Shasta sulked and said No thanks, and that he wasn’t hungry. And he tried to put on what he thought very grand and stiff manners, but as a fisherman’s hut is not usually a good place for learning grand manners, the result was dreadful. And he half knew it wasn’t a success and then became sulkier and more awkward than ever. Father’s an absolute brick. I’d be just as pleased – or very nearly – at finding he’s my father even if he wasn’t a king. Even though Education and all sorts of horrible things are going to happen to me. As his bare foot touched the sand he screamed with pain and got one foot back in the stirrup and the other half over Bree’s back before you could have said knife. A child who tries to eat grass, a child whose shoeless feet scorch in the hot sand: here is poverty made pitiable and tangible. Moving on: after the 'real' Prince Corin reappears, Shasta hurries to the Tombs of the Ancient Kings, where he and his friends agreed to meet if they become separated in Tashbaan. '[A]nd now the sun had really set. Suddenly from somewhere behind him came a terrible sound. Shasta's heart gave a great jump and he had to bite his tongue to keep himself from screaming. Next moment he realised what it was: the horns of Tashbaan blowing for the closing of the gates.' 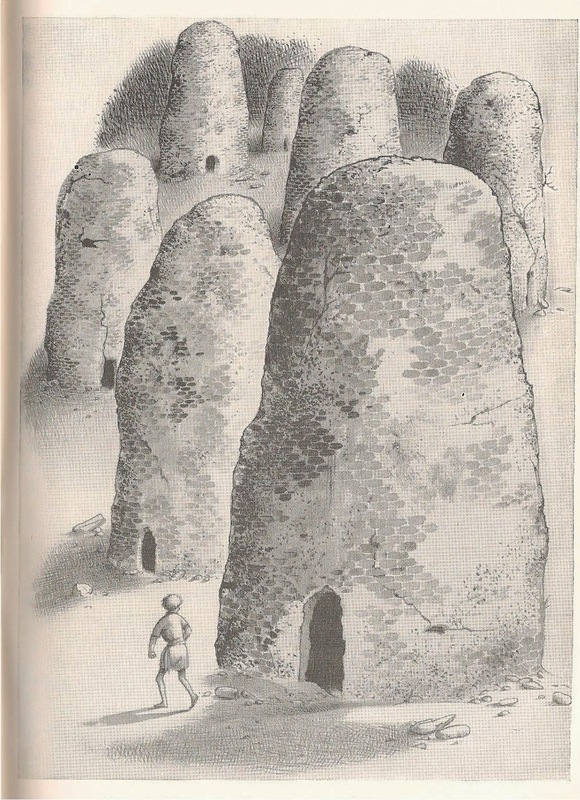 In one of the most atmospheric chapters in the book Shasta spends the night alone beside the Tombs, which are like 'gigantic beehives ... black and grim', later even more scarily personified as '... horribly like huge people, draped in grey robes that covered their heads and faces'. Aravis meanwhile has been having her own adventures: recognised by her girly friend Lasaraleen, she effects a hair-raising escape from the palace at night during which, crushed behind a sofa, she and Lasaraleen overhear Rabadash and the Tisroc plotting treacherously to attack King Lune's castle of Anvard - and witness the cringing, sycophantic behaviour of her affianced husband, Ahoshta the Vizier. With Lasaraleen's help, Aravis and the horses rejoin Shasta at the Tombs where they pool their information. Aravis carries the news of Rabadash's plans; Shasta knows the secret route across the desert. The race is on to reach Archenland ahead of Prince Rabadah, and warn King Lune. It will turn out that Aslan has been masterminding nearly the whole plot of THHB – as he himself explains, walking unseen in the mist unseen beside Shasta when he is lost. Lewis wants us to find this moving, perhaps even comforting. At ten years old I accepted it but it didn’t move me, and to me now it seems manipulative, reducing the characters to puppets as Aslan reconfigures Shasta’s account of his misfortunes to show that all the ‘bad’ things which have happened to him were in fact for the good. There is something uncomfortably controlling about Aslan’s sequential incursions into the lives of Shasta, Aravis and Bree, even though Bree certainly deserves to be taken down a peg or two. As a child I found the scene irresistibly comic in which Bree confidently asserts that Aslan is not a real lion – while Aslan creeps up behind him. “No doubt,” continues Bree, “when they speak of him as a Lion they only mean he’s as strong as a lion or (to our enemies of course) as fierce as a lion. …it would be quite absurd to suppose he is a real lion. … Why!” (and here Bree began to laugh) “If he was a lion he would have four paws, and a tail, and Whiskers!... Aie, ooh, hoo-hoo! Help! For just as he said the word Whiskers one of Aslan’s had actually tickled his ear. It is still funny. Just not as funny as it was. The religious message in THHB seems to me painting-by-numbers. A series of events is worked out to illustrate a set of propositions: God ordains all things; God knows and judges all things; God will reward the good and punish the sinner; God is with us always. It reminds me of those ‘footprints in the sand’ posters which can be bought from Christian bookshops with a little parable in which God reassures us that ‘when you thought you were walking alone, that is when I was carrying you.’ Such parables undoubtedly do comfort some people, and heaven knows we all need comfort. However, sincerity is required to make these things work, and in The Horse and His Boy I’m not convinced Lewis is sincere. It’s all a little too clever. 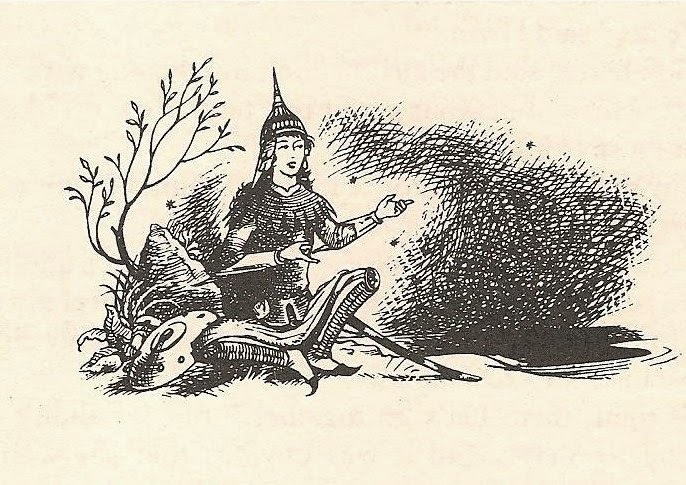 There is no sense that anything springs from a deep emotional source and this is evident at the end of Chapter XI when Aslan at last reveals himself to Shasta. Lewis strains unsuccessfully for affect: at least it doesn't work for me. It was from the Lion that the light came. No-one ever saw anything more terrible or beautiful. … After one glance at the Lion’s face [Shasta] slipped out of the saddle and fell at its feet. He couldn’t say anything but then he didn’t want to say anything, and he knew he needn’t say anything. The High King above all kings stooped towards him. Its mane, and some strange and solemn perfume that hung about its mane, was all around him. It touched his forehead with its tongue. This is a stern, remote, High Church Aslan far removed from the flesh and blood Lion who played so joyfully with Lucy and Susan in The Lion, The Witch and the Wardrobe – as far removed perhaps as the Jesus of the Gospels seems from the mosaic Christs in Byzantine basilicas. The Aslan who sacrificed himself for Edmund, whose blood and pain restored Caspian to life, youth and strength, has become the Aslan who tears bloody stripes in Aravis's back and even scratches Shasta in retaliation for having once thrown stones at a cat. It's a harsh and retributive transformation. Still, as a child, I felt the adventure had been wrapped up very satisfactorily. The story ends in slapdash humour. 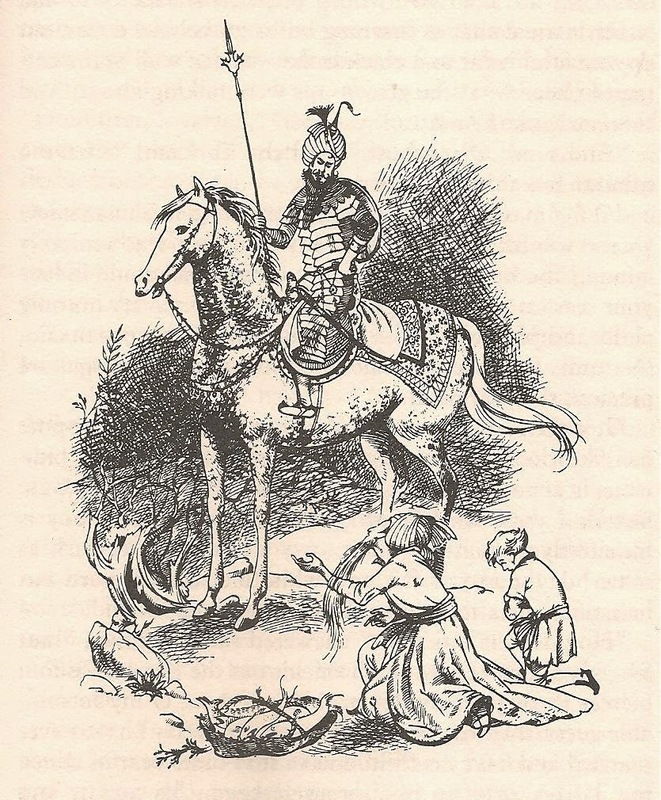 Prince Rabadash makes a fool of himself (“The bolt of Tash falls from above!” – “Does it ever get caught on a hook half-way?”) and is transformed by Aslan (punitive to the last) into a donkey so he can do no more harm. Shasta is reinstated as Prince of Archenland. Bree casts off his anxiety and has a good roll. Cor and Aravis’s eventual marriage, in order to go on quarrelling ‘more conveniently’, seemed to me a reasonable and un-sloppy basis for a relationship; they were clearly good friends. I closed the book and reached for the next. What has surprised me most on this re-reading isn't so much that I found myself addressing questions of racism; I knew I would have to do that. What really surprised me is how didactic, how prescriptive I've found a book which I've remembered as perhaps the least 'religious' of the Narnia stories. I suspect that it turned out this this way because Lewis never really put his heart into the story at all... except for the character of Bree, horsiest of horses. * Flying carpets though, as Ruth B. Bottigheimer has recently pointed out in an interesting essay in Gramarye, Issue 13, are not in fact native to the Arabian Nights tales. This my least favourite of the series too. Interesting you should mention Geoffrey Trease - he’s a writer I love for the very reasons you mention, but I discovered both him and Lewis as an adult. And I wonder how many of his books are still in print? I’ve only able to find a few print ones on line, only three in ebook, and one audiobook (read by Clive Mantle, who was Little John in Robin Of Sherwood). Yet children are still reading Narnia books. And Enid Blyton... 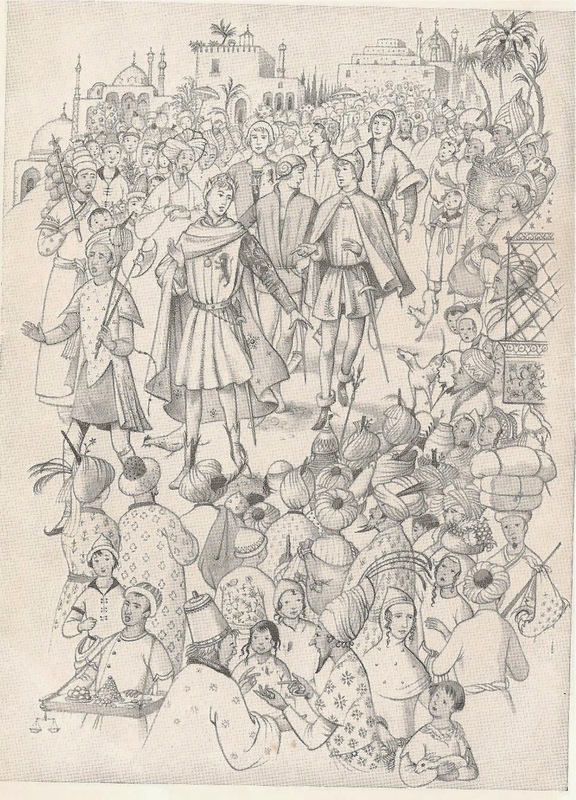 The most popular Trease book still in print seems to be Cue For Treason, in which a girl disguises as a boy to escape an unwanted marriage and gets a job as a boy actor in Shakespeare’s company. In the last scene, she is teaching her children to climb trees. A nice ending! Some fascinating thoughts on The Horse And His Boy! And you’re right, all the magic is taken out of the Arabian Nights and Aslan is not very likeable. I don’t like him much after The Lion, The Witch and The Wardrobe. He is so pompous! You're right Sue, it is surprising more of Trease isn't still in print. I have my old copies still - yes, Cue For Treason - plus The Crown of Violet (ancient Athens, The Red Towers of Granada, and The Hills of Varna. The rest I used to get from the library. He was very prolific but always kept a good standard. I hope Katherine doesn't mind me butting in, but may I recommend Peakirk Books if you're looking for works by Geoffrey Trease? They have loads of oop copies!